We finally finished our eco-conscious kitchen renovation project several weeks ago and I’m excited to share it with you. 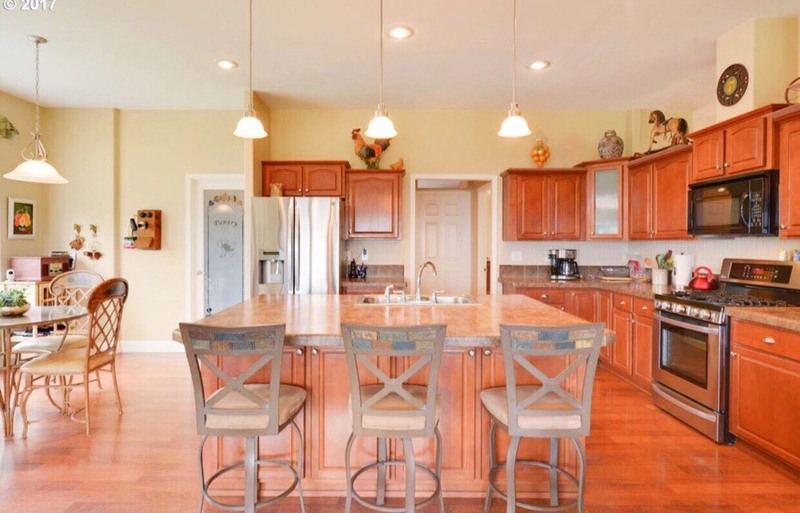 When we were house hunting last year, the kitchen was always the room which was the most important to me. 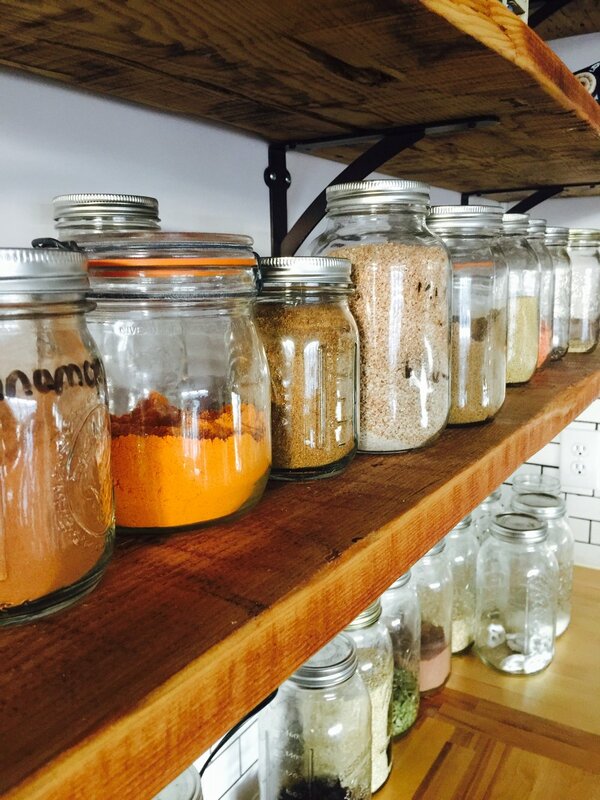 As a person who loves to cook, loves to host play dates and gatherings of friends, spends her evenings at the kitchen table working on little creative projects, it was always going to be the heart of our home. I dreamed of a bright light space, great storage and plenty of preparation space as I tend to 'spread' when I bake (so Jonathan would say). I had dreamed of us buying an old farmhouse, with a big white ceramic sink and vintage rustic appeal, old wooden floors, white sash windows and dusty old cupboards. Well, we didn't buy that farmhouse and although the kitchen we did buy was a large bright functional space, it lacked charm and character and just wasn't 'me'. With limited funds it was the one room we decided to prioritize for a little renovation. With a head full of Pinterest inspiration, but with a limited budget and a passion for eco-friendly alternatives the challenge was on the create a space we loved. Our wonderful friend Rick helped with the renovation. Here's what we did. We love the look and feel of old wood (the bigger the knots the better I say). We were also keen to minimize our environmental footprint, so reclaimed wood became our material of choice. We purchased the wood from Salvage works PDX who repurpose wood taken down from old barns and buildings. Bought as long, unfinished boards, they were then sanded and finished by my father-in law painstakingly in our garage. 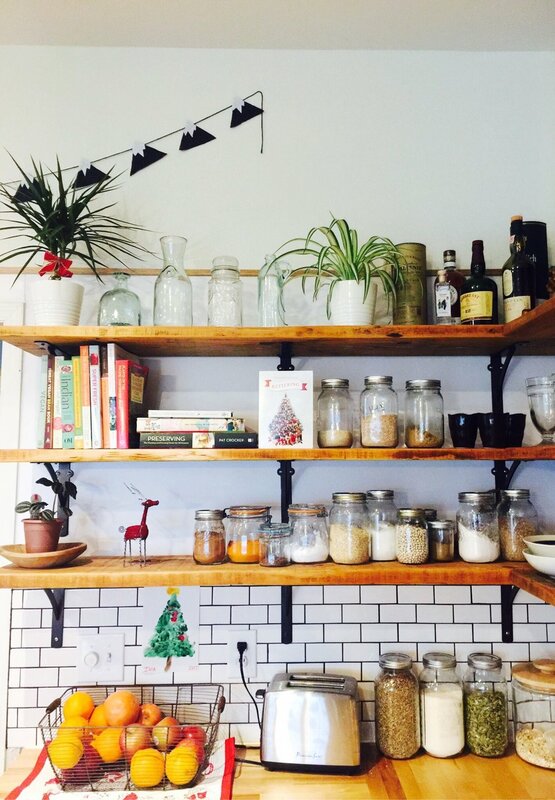 They are now home to my thrifted treasures, dishes, plates and glass jars of bulk foods and favorite vegan cook books. I couldn't find a second-hand one which worked measurement wise, so it was off to good old IKEA. 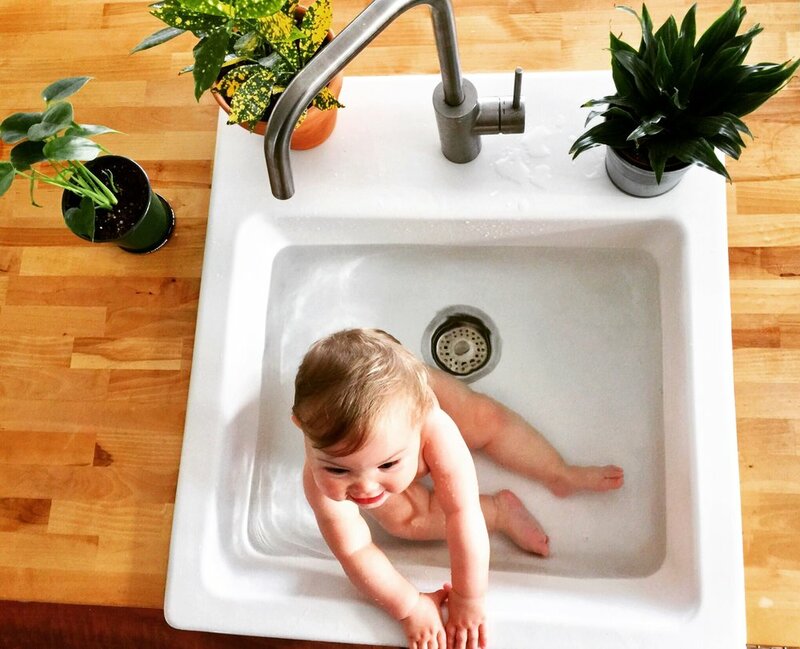 I have always dreamed of a porcelain white farmhouse sink, a place to bath sweet babies, wash homegrown greens straight from the garden and soak all my houseplants for weekly baths. I searched high and low across all the building reuse stores for a used one but as we were working with tight dimensions (as it is on the island) we just couldn't find a used one so chose to go with this one from IKEA. Three months in and I love it. Easy to clean with my favourite homemade, natural sink cleaner. While washing the dishes, the view over the mountains still takes my breath away, watching weather and light in the valley beneath us shift and change tones. If you’re going to spend a lot of time washing dishes (which for a family of six is inevitable) it’s made slightly easier by our view. We decided to choose wooden butcher block tops made from a renewable/sustainable source, also compostable if and when in the future they are replaced. We plan on using all the off cuts for other creative projects. Just love the natural grains and colours. To save cost but also to reduce waste we chose to simply paint our existing lower cabinets white. A family effort over Christmas saw this part of the project started though it did take several weeks to complete. It’s amazing how long jobs take when you’re parenting four little people and trying to sand and paint and re-hang cupboard doors. We seemed to average 1-2 doors a week. 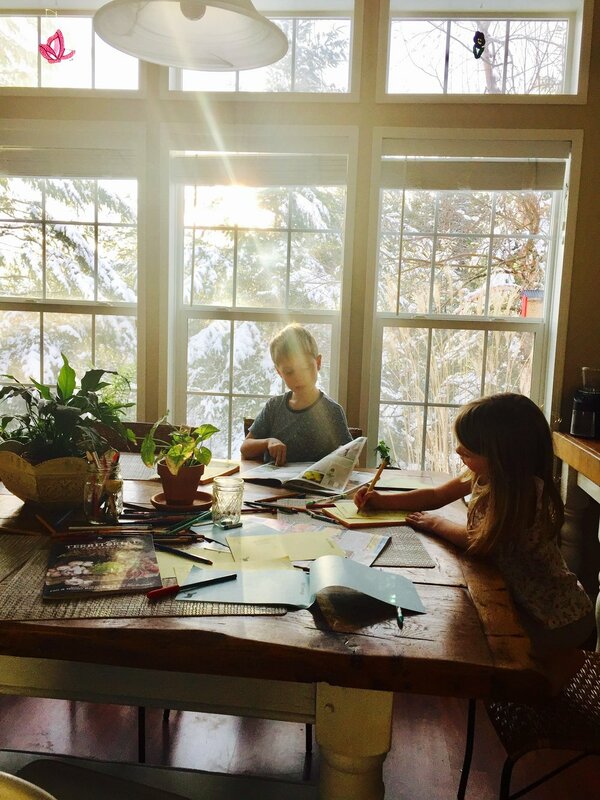 I had long dreamed of a big solid wood farmhouse table, you know the ones you see on Instagram with a tribe of happy homeschooling kids sitting around engrossed in their nature studies. However, our budget was very humble. While hunting around consignment shops for furniture prior to our move Jonathan stumbled across this in a dark and dusty corner. It was bright purple, covered in a thick heavy finish. Convinced it was solid wood, and for $100, we took a gamble. After hours of stripping the paint, sanding and finishing (again, thanks to my handy father-in-law), then repainting the legs with homemade chalk paint (Jonathan did that), it turned out beautifully. I love the way the sun sets off the wooden grains when it creeps around mid-afternoon. The perfect spot for our family of six to enjoy meals, my desk of an evening, a spot to drink tea with friends and enjoy an afternoon craft with the kiddies. So here it is! 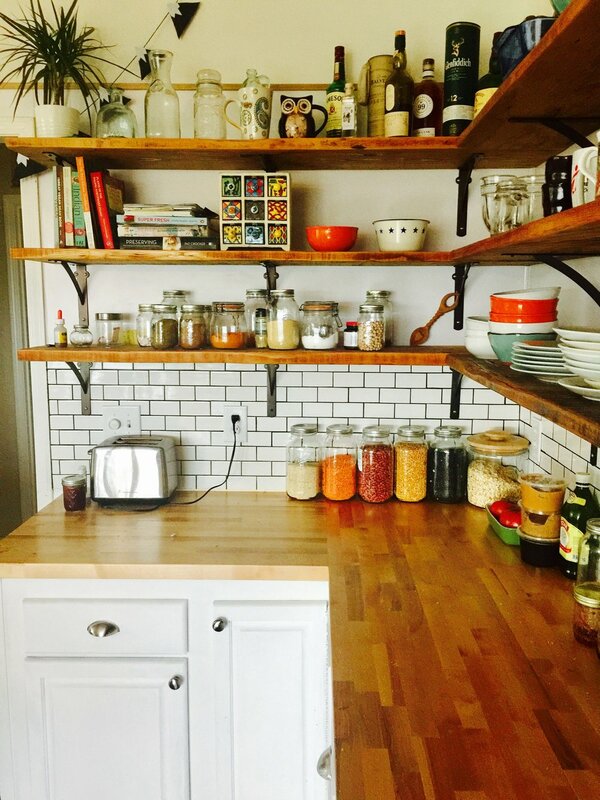 my dream kitchen on a budget. I’m looking forward to adding lots more plants and teapots when the budget allows, because no home is complete without an indoor jungle and a teapot for every occasion.